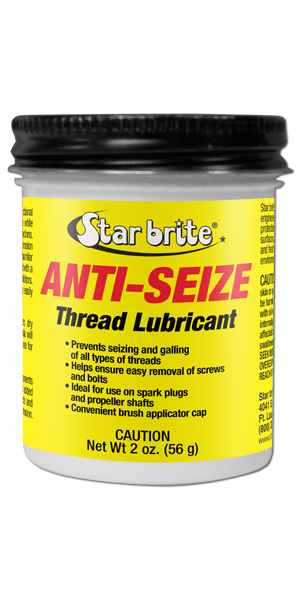 Star brite® Anti-Seize compound contains functional fillers that form a barrier against corrosion while preventing seizing and galling of threaded connections. The non-metallic fillers guard against galvanic corrosion by forming an insulating barrier between dissimilar metals. The proprietary grease base is formulated with a very high concentration of premium corrosion inhibitors. The smooth texture allows the compound to be easily applied on both large and small assemblies. DIRECTIONS: Coat clean, dry threads or components with the compound and then assemble. For added protection, apply to bolt heads, exposed threads and other surfaces that need to be protected from corrosion. Keep container sealed when not in use. For best results apply only to clean surfaces; dry surfaces provide better adhesion, but the formula will work on slightly damp surfaces. Note: Do not use for oxygen systems. Star brite® Anti-Seize is specifically engineered to provide maximum protection of threaded metallic surfaces against extreme pressure and heat even in the harshest marine environment.